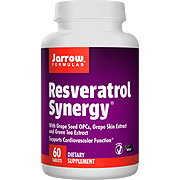 Jarrow FORMULAS® Resveratrol Synergy™ contains the flavonoid resveratrol, plus catechins (green tea), anthocyanins (grape skin) and proanthocyanins (OPCs from grape seed). Resveratrol (3,4,5-trihydroxystilbene), extracted from Huzhang (“tiger cane”) root, protects cardiovascular function by promoting circulation. Green Tea contains flavans, Grape Seed OPCs are flavanols (condensed flavans), and Grape Skin contains anthocyanins. These synergistic plant extracts spare vitamin C and protect capillaries. Other Ingredients: Cellulose, calcium phosphate, modified cellulose gum, stearic acid, and magnesium stearate. the energy that you get from this product is great. the green tea extract makes it a really great blend and I am really happy with it. 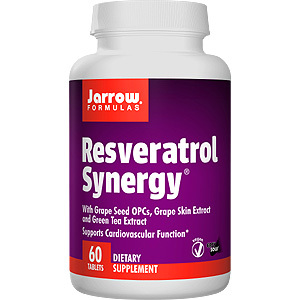 Resveratrol Synergy - is shipped in a discrete, unmarked package. Orders are processed immediately and usually take about 3 to 5 working days to be received. We do ask that you try it for 2 to 3 weeks to feel the full effects. Any information received is used only for order processing and shipping purposes. Your information, such as e-mail address, will never be disclosed to a third party.